I am one lucky guy. 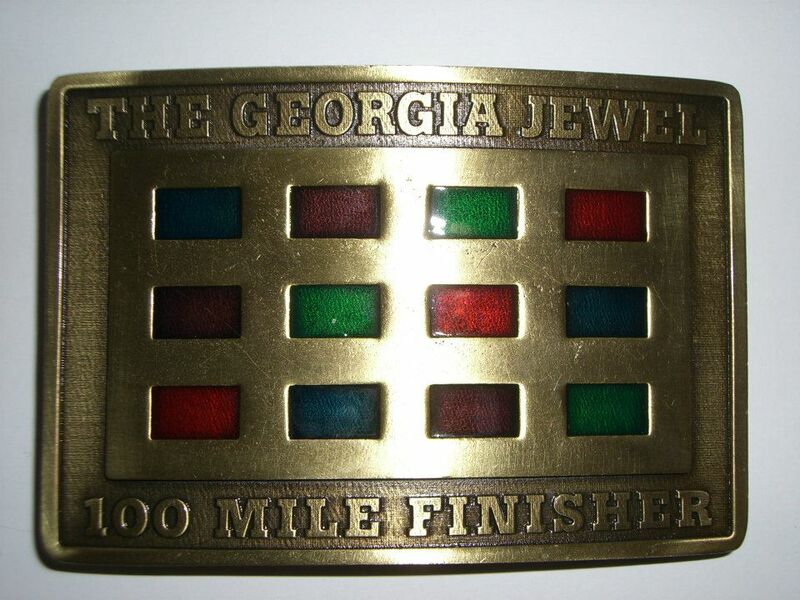 Ronnie Hines, James Duncan and Ed Johnson all agreed to crew and pace me at the second edition of the Georgia Jewel 100 Mile Endurance Run. After running the inaugural Double Top 100 Mile Race in March, Ronnie and Dan "The Man" Burstein put a bug in my ear. "Why don't you go for the "Pinhoti Grand Slam"? While there is no official event of that name, we all decided that running all 3 100 mile races on the Pinhoti trail in Georgia and Alabama in one calendar year should constitute an unofficial "Slam". I thought it was a cool idea. I already had enough reason to attempt the Pinhoti 100 again after failing at my first attempt two years ago. 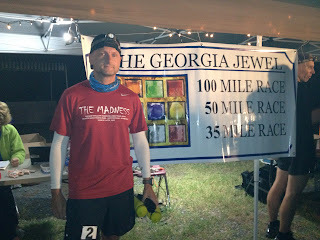 But since I had already run the inaugural Georgia Jewel 100 last year, I needed an additional reason to run that one again and this idea fit it perfectly. I went through my usual logistics planning weeks ahead of time, only to wait until the day of my departure to actually pack my stuff. The GPS in my car was loaded with the aid station locations for my crew and my pace chart was laminated and safely stuck into my running pack. 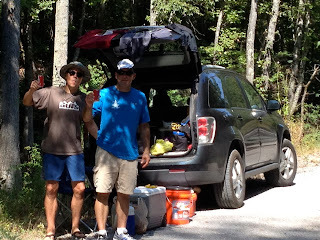 I basically tossed almost all of my running gear into the back of my car, so that my crew could just access whatever was needed when I'd hit the aid stations. Not having to pack drop bags made my planning a whole lot easier. Ed and I left Huntsville, Alabama just after 1PM and headed for Dalton, Georgia. James arrived there a couple of hours before us as he was already in Atlanta on a work related project. Ronnie would join up with my crew Saturday around noon after flying into Atlanta and driving straight to one of the aid station to meet up with us. Ed and I arrived in Dalton around 4:30PM. 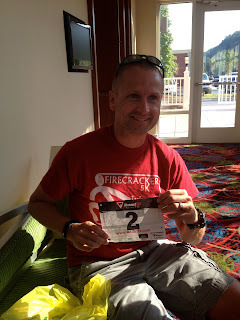 We met up with James, who had already checked in to the Courtyard Marriott and we walked to the race hotel for the official check in and packet pickup after dropping off our stuff in our room. I picked up my packet, met a few old and new friends and listened to the pre-race briefing. Afterwards, we headed to the Dalton Depot, where a couple of other local ultra runners from Huntsville (Cary Long, Eric Fritz, Rob Youngren and Blake Thompson) joined us for a carbo dinner. 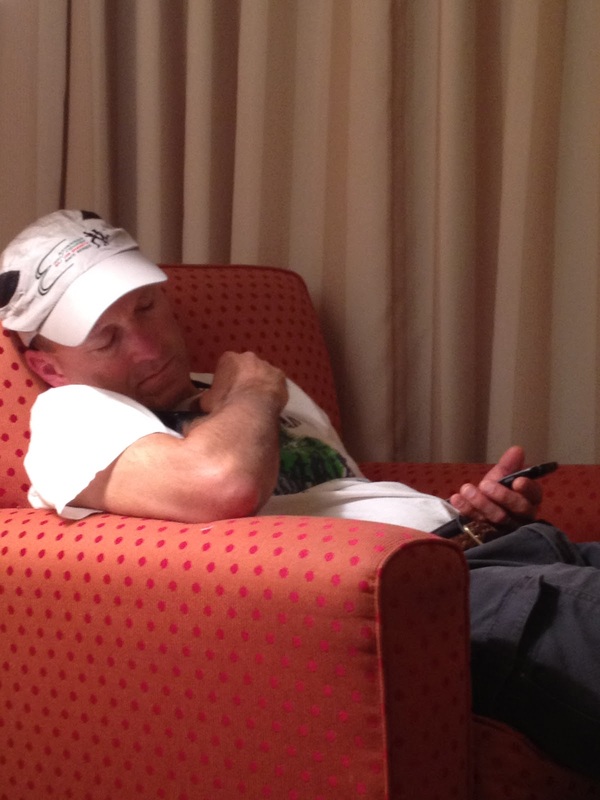 By 8pm, we were back in the hotel ready to catch some shut eye before our 2:45AM wakeup call. Well, i guess that wasn't meant to be. After rolling around, my mind racing and consumed with the race, I managed a whole 3 hours of sleep. Bib #2, how did that happen? When the alarm went off at 2:45AM, I quickly fixed myself a cup of coffee and got dressed. James and Ed got ready as well and we headed to the race start. 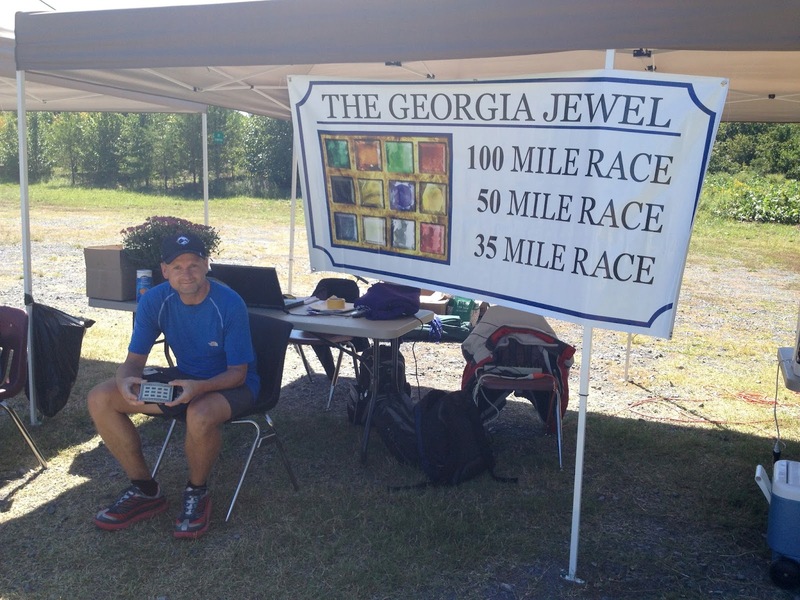 I joined 47 other runners ready to tackle the Georgia Jewel 100. I was one of only three runners that were attempting to complete the Jewel for the second time. Yeah, I'm ready! Can you see the determination in my face? Race director Karen Pearson sent us on our way at 4AM sharp. the 35 and 50 milers would follow at 6AM. I was feeling confident. 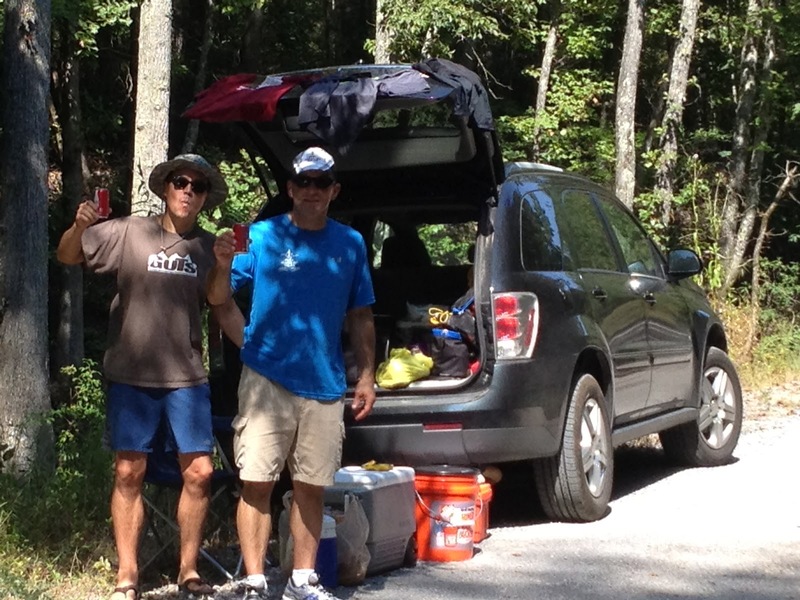 I had my crew ready to meet up with me for the first time at the 17 mile aid station. I had my pacing plan and decided to stick to it as long as I could. After all, the primary goal was just to finish. I settled into an easy pace, chatting with some runners, but mostly ran on my own, a few runners ahead and behind me. Normally, I would continue to ramble on about how I progressed from aid station to aid station at this point in my race report. 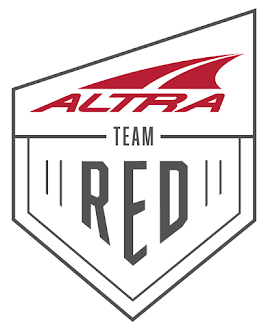 However, I've run the race before and this time I felt it much more important to describe the best ultra running has to offer its participants and that is...drum roll...its participants. Around mile 40, I stumbled out of the woods and onto a country road. I knew i had 2 miles to cover on this exposed road before I'd make it to the next aid station, but as it turned out, the last 6 miles (or rather 8 miles due to a missed turn) really took it out of me and I experienced overheating for the very first time. I was ready to just lay down in the middle of the road. I was spent, but there wasn't any shade, so I couldn't lay down. Instead, I continued to stumble to a bridge. I stopped, I couldn't go on. I had nothing left. I wouldn't make it another 2 miles, no way! I started looking for cars, any cars. I was just about to stick out my thumb to hitch a ride when angels appeared before me....well, it was Willy's crew, ultra runners par excellence Vikena Yutz and Philip Sustar. "Are you alright?" they asked. "No" I responded while hunched over, "I'm done". Kena and Phile picked me up, led me across the street to lean against a bridge barrier before telling me to sit down in a tiny spot of shade. The recognized that I was overheating. Thank goodness somebody did, because I was clueless. They handed me ice packs, placed them around my neck and on my head, and handed me an ice cold blue Powerade and a bottle of sparkling water (one of my favorite beverages). I was ready to suit, I didn't think I could recover, but Kena and Phil assured me that it would pass. "You're looking better already" and "It will get better, trust us!" they said. "This is a battle of attrition and you've just taken a one-two punch from the Jewel. Now it's time to get back up and show it who's boss". While those are probably not the exact words, they do represent what Philip Sustar told me at mile 40 as I was sitting there. The race would have been over right there and then had it not been for these two guys. It also wasn't the first time that they helped me out. They've helped me at other races before and I've seen them do the same for countless others. Phil and Kena are the perfect examples of what makes ultra running more than just a sport. They didn't have to help me, they certainly didn't have to hang around until I was able to keep moving...but they did it anyway. 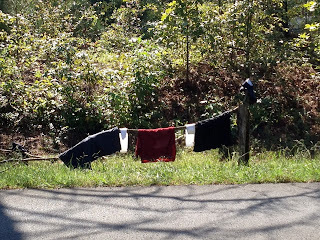 I got off my a$$ and started to walk slowly, one foot in front of the other, until I reached the next aid station. And who was there waiting for me? My crew, Ronnie, James and Ed, guys who were out there to help me reach my goal. They didn't have to, and yet, here they were, giving up their entire weekend for me. And they didn't just provide me with food and water. 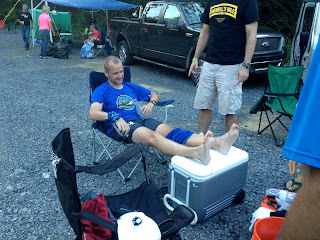 They moved from aid station to aid station, getting a chair ready for me, getting me dry clothes and dry shoes. They even took care of my feet to keep blisters to a minimum. Now that's what I call real friends! While I was struggling through the final 17 miles of the race with Ronnie as my pacer, Ed decided to take a nap while sending a text. And when they were not tending to my every need, one of them was running with me for the entire second half of the race to pace me and to just be there to keep me company through the night. 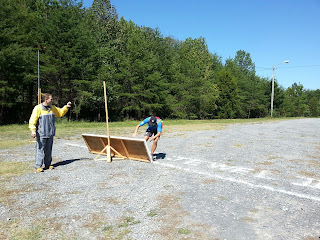 Then there were the countless volunteers at the start and finish area and at the aid stations. For 36 hours, they selflessly provided assistance to almost 150 runners and I'm sure that they always received the gratitude they they all deserve. Hopefully, some of them will ready this and know how much I and all the other runners appreciate everything they did. Ed paced me from mile 52 to mile 72, James paced me for the next 15 miles and Ronnie dragged me the last 17 miles. After 32 hours and 35 minutes, I crossed the finish. 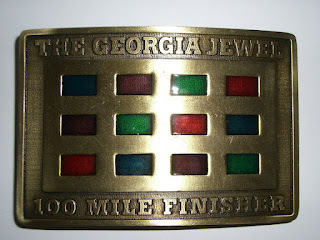 Yes, I received a Georgia Jewel 100 Mile Finisher buckle, but they are the ones that earned it. I had the easy part, I just had to put one foot in front of the other, listening to their instructions as I went. They had to listen to me whine, complain and try to negotiate my way out of running, but they persevered. As a result, I persevered. 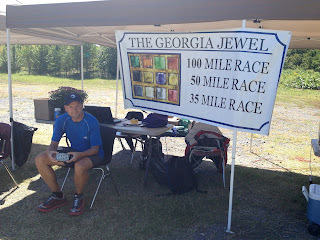 One happy camper at the Georgia Jewel 100 finish line. As a bonus, I got to watch Liz Bauer finish and break the world record of 100 mile ultra marathons run in one year (26). But Liz isn't done yet, she intends to add 4 more before the year is over. What an amazing performance. As an ultra runner, you're not just surrounded by great people but by great people that are great athletes, too. It's been a joy to follow your adventures this year, Martin. Looking forward to getting a photo with you after Pinhoti 100 with both of us holding up our redemption buckles. @Jason, I think we'll both have a great race at Pinhoti 100. It's redemption time, baby! @Kevin, I'm glad Ronnie was able to help out. He is one incredible individual, ALWAYS willing to help out anyone and everyone. Without him and the rest of my crew, I would not have finished. I passed on your comment to him. Hopefully, he'll email you or get in touch with you via FB. I do know he'll be at Pinhoti crewing a couple of runners, in case you're going to be there.